A bundle of James Bond - Ultimate Edition check discs arrived today, and I've spent a few hours investigating the differences between the new versions and the 2000 editions (specifically, the Region 1 editions, which didn't have some of the problems the UK versions had). I'm not going to have time to review them in any depth - to do the job properly would take me a couple of days per film - but I will offer some initial thoughts that might help you decide if they're worth getting! Click here for some notes! I was going to upload a whole slew of menu screens from the new discs, but DVD Times is doing a fine job with those - I suggest you give them a visit! 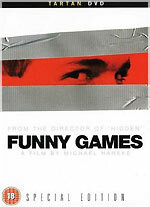 A few words about Tartan's new Special Edition version of Funny Games, which is released next week. The new re-mastered version improves over the old in several respects: it's a new anamorphic transfer - this time without burnt-in subtitles - and it's on a DVD-9, rather than a DVD-5. The average bit-rate is a lot more adaptive, and, at 6.4Mb/s, has more data allocated to it than the old version, which had an average bit-rate of 5.58Mb. Contrary to the press release, though, it does not have 5.1 audio - it's a 2.0 track. Note, too, that the disc is coded for Region 2 only (the sleeve says Region 0). The new disc has a new eighteen-minute video interview with the director (the old version's Director Interview was a text article). The Special Edition also contains a trailer for the film (1m), and trailers for Guy X, Primer, The Proposition and Battle in Heaven. Director Michael Haneke's on a roll right now, with the success of his most recent film, Hidden (Cache). Tartan will be co-producing an English language version of Funny Games for release next year, with Haneke directing, and Naomi Watts starring. Menu screens from this release can be seen here. I've added a better pack-shot for The Tribe - The Complete Series 4, below, if you're interested! A new review... and no-one's more surprised than I am! What began as a quick plug for this page turned into something a bit more substantial. It's of Replay's DVD for the BBC sitcom Joking Apart. Click here, or on the sleeve image, left, to read the review! The disc marks the debut of a small independent DVD label that deserves your support. Read the review to find out more! I have some more details about the eagerly-awaited batch of BBC telefantasy titles that is being released on July the 24th (re-scheduled from July the 17th). All the Incoming links have been updated (click on any title to find the best price from our affiliated etailers). Contains sixteen of the seventeen episodes from the first season (Ticket To Terror is no longer in the BBC archive), and the two surviving episodes of the thirteen second season episodes (Black Echo and A Sinister Sort of Service, the season finale). A For Andromeda – 147m reconstruction of the seven-part series, using telesnaps, existing clips and film inserts, including the available (as transmitted) footage from episodes two (The Machine - seven intact scenes), six (The Face of the Tiger, exists in its entirety), and seven (last two reels survive). The surviving edited footage has optional commentary by director Michael Hayes and star Peter Halliday. Eureka! will add F.W. 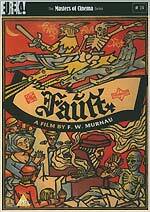 Murnau's 1926 adaptation of Faust to their Masters of Cinema range on July the 3rd. The film exists in several different versions. To save wear and tear on the delicate film elements, the film was shot with two cameras side-by-side. From this footage Murnau assembled his preferred version, which would be used for domestic distribution, and a secondary version, for export. Evidently, more care was taken with the domestic version, which boasts superior composition and tighter editing. One amusing difference between the two versions is the use of a real bear in the domestic version, but a man in a bear suit in the export version. Both versions are on the two-disc set. The recently re-discovered domestic version was restored by Luciano Berriatua for Filmoteca Espanola. The disc boasts a progressive transfer, with the original German intertitles (by acclaimed poet Gerhart Roehrig), accompanied by a new harp score by Stan Ambrose, in addition to the Timothy Brock orchestral score, recorded by the Olympia Chamber Orchestra. Bonus features include a full-length commentary by critics David Ehrenstein and Bill Krohn; Tony Rayns on Faust featurette (20m); Faust - The Different Versions (video comparison by R. Dixon Smith, 20m); production stills and promotional art gallery; a twenty-eight-page booklet with a new essay by Peter Spooner, and an article about the different versions of the film, by R. Dixon Smith. The RRP is £22.95. Revelation Films will release The Tribe - The Complete Series Four on August the 21st. The seven-disc set will feature fifty-two episodes of the popular five TV series, in 16:9 anamorphic widescreen format, with Dolby Digital stereo audio. Bonus features include printable scripts from every episode, and a photo' gallery. The RRP is £34.99. Incidentally, Revelation's sales notes state that the first DVD set of The Tribe has sold nearly 13,000 units so far. That's not too shabby for a relatively obscure series that's had very little support from the genre or mainstream press! 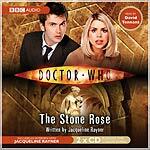 There are three new Doctor Who audio books: adaptations of novels recently published by BBC Books. These are read by David Tennant. 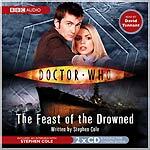 The titles are The Feast of the Drowned, by Stephen Cole, The Resurrection Casket, by Justin Richards, and The Stone Rose, by Jacqueline Rayner. 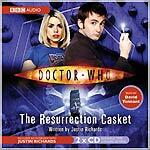 Each two-disc set also features an interview with the author, conducted by Doctor Who Magazine's David Darlington. BBC Audiobooks completes the Spiderwick Chronicles trilogy on July the 3rd, with the release of The Wrath of Mulgarath, a two-disc set read by Star Wars' Mark Hamill. The RRP is £9.99 (the same as the previous two releases: The Field Guide & The Seeing Stone and Lucinda's Secret & The Ironwood Tree). Maureen Lipman, who recently appeared in Doctor Who, reads Jill Tomlinson's The Gorilla Who Wanted To Grow Up, a single-disc release which has an RRP of £5.99. 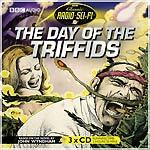 The Day of the Triffids is Giles Cooper's six-part dramatised adaptation of John Wyndham's classic novel. It stars Gary Watson, Quatermass and the Pit's Barbara Shelley, Paul Temple's Marjorie Westbury, and a host of names that will certainly be familiar to Doctor Who fans: Last of the Summer Wine's Peter Sallis, Peter Pratt, Christopher Bidmead and David Brierly. The three-disc set will include ten minutes of material that was removed prior to the serial's sale overseas. Aliens in the Mind is a six-part SF thriller from 1977, based on a story by the great Robert Holmes. 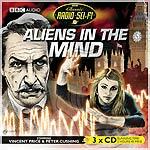 It pairs two genre greats, Peter Cushing and, making a rare BBC appearance, Vincent Price. It also features the late Richard Hurndall, who took on the role of the first Doctor in the Doctor Who story The Five Doctors. This title has an RRP of £15.99. 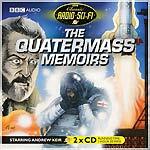 The Quatermass Memoirs is a terrific five-part series from 1996 which re-tells Nigel Kneale's classic Quatermass stories, using archive news material to put the series in context, and narration from Kneale himself. 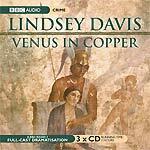 This two-disc set has an RRP of £12.99. All three titles are also available for download, for £10.80 each, but do yourself a favour, and get the CD versions, which come with booklet notes by Andrew Pixley, and sleeve art by fan favourite Chris Achilleos. There's a Roobarb's DVD Forum thread about the Classic Radio Sci-Fi collection here. 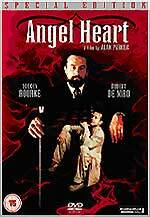 Momentum Pictures will release a two-disc Special Edition version of Alan Parker's atmospheric Louisiana-based thriller Angel Heart on August the 21st. The film, which stars Mickey Rourke and Robert De Niro, will be presented in anamorphic 1.85:1 format, with Dolby Digital 5.1 audio (the current Director's Chair version has a 2.0 audio mix). The bonus features are listed as follows: Disc One - Introduction by Alan Parker; three Making of... documentaries; interview with Alan Parker; Personality Profiles; Behind the Scenes of Angel Heart; Photo Gallery; Disc Two - Interviews with Cast; Voodoo and Dance featurettes; Guided Tour; Featurettes. The RRP is £17.99. Contender Home Entertainment will release the eighth and last season of Will & Grace on August the 7th. The set has an RRP of £49.99. There'll also be a forty-eight disc Complete Series box set, which will feature all 190-odd episodes, as well as "Never before seen extras!" (This is not to be confused with the earlier 2004 "complete" (series 1-4) or 2005 "complete" (series 1-6) box sets. Since the series has now ended, it's safe to assume that they mean "complete" this time! Momentum Pictures will release the intriguing-sounding supernatural thriller The Dark, which stars Sean Bean and A History of Violence's Maria Bello, on DVD on September the 4th. The disc will feature interviews, an alternate ending and a trailer (the US disc, from Sony, has only the alternate ending). No technical spec's were released. The RRP is £17.99. Twentieth Century Fox Home Entertainment will release the latest Farrelly Brothers' comedy, The Ringer, on DVD on July the 24th. The film, about a betting scam involving a ringer in the Special Olympics, stars Jackass's Johnny Knoxville, and Red Dragon's Brian Cox. The disc will feature a message from Special Olympics chairman Tim Shriver; commentary track by director Barry Blaustein (presumably the same one that's on the US disc - i.e. by Barry Blaustein, screenwriter Ricky Blitt, producer Peter Farrelly, Johnny Knoxville, Edward Barbanell and John Taylor); a Special Olympics featurette; Let The Games Begin - A Look At The Ringer; sixteen deleted scenes and an Inside Look at the forthcoming Michael Douglas / Kiefer Sutherland film The Sentinel. The RRP is £15.99. The fourth film in the Scary Movie trilogy, Scary Movie 4 (well, duh), will be released on DVD on August the 14th. Scary Movie 4 - Uncut and Unsanitized (sic) offers a version of the film with additional material that was "deemed to risqué" for the theatrical version - where, presumably, they expected a more juvenile audience than would watch the film on DVD. The film features several returning cast members, including Anna Faris and Carmen Electra. This time the producers spoof recent films including Saw, The Village, The Grudge, War of the Worlds, Million Dollar Baby and Brokeback Mountain. Bonus features include a commentary by director David Zucker, producer Robert Weiss and writer Craig Mazin; deleted and extended scenes; bloopers; a featurette on Zucker, The Man Behind The Laugh; several things that seem to be featurettes (Zany Spoof Humour - Zucker Style; An Interviewee's Worst Nightmare; The Visual Effects of Scary Movie 4; The Youngbloodz and Rappers...Actors); an NBA / Scary Movie 4 spot; and a theatrical trailer. Hong Kong Legends will release a Special Collector's Edition of John Woo's war movie Heroes Shed No Tears on July the 17th. The film, about a Chinese mercenary who is hired to kidnap an infamous Thai drugs baron, and bring him to justice, stars Eddy Ko. The disc offers the film in "digitally restored and re-mastered" anamorphic 1.85:1 format (from an HD source), with a choice of audio tracks: Cantonese and English-dubbed Dolby Digital 5.1 versions, and a Cantonese Dolby Digital 2.0 track, with the option of English and Dutch subtitles. The disc will feature an interview with Woo; a Tribute to Lam Ching Ying featurette; and a trailer gallery. The RRP is £16.99. A company called Dogwoof will release Jaume Balagueró's acclaimed award-winning horror film The Nameless (Los Sin nombre) on DVD on July the 31st (not the 24th, as some sources are quoting). 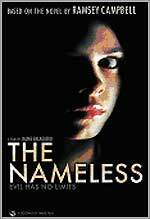 The 1999 film, (an adaptation of Ramsey Campbell's 1981 novel The Nameless), is also about a couple grieving for the loss of a young child. The hook in The Nameless, though, is that, five years after the child's death, the mother gets a phone call, saying "They wanted you to believe I was dead". No technical spec's were announced (it should be 1.85:1, with 2.0 Spanish audio, if the Region 1 (anamorphic) and Region 4 (non-anamorphic) versions are a guide. There are no bonus features listed on the press release, but most of the etailers are listing deleted scenes, a gallery and a trailer (other territories' versions feature a director's commentary track, a music video, and a Making of... featurette). So, either the press release is in error, or the etailers are. If I get any more information, you'll have it! The RRP is £14.99. 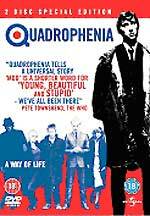 Universal Pictures will release a 2 Disc Special Edition version of Franc Roddam's 1979 film Quadrophenia on August the 7th. The film is presented in "digitally re-mastered widescreen" format, with a "brand new stereo audio track". Bonus features on the new edition include a documentary titled A Way of Life: Making Quadrophenia; a location visit with the director, On Location With Franc; and a commentary track, by Franc Roddam and stars Phil Daniels and Leslie Ash. The RRP is £17.99. 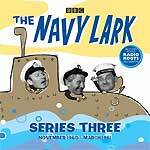 ...The Navy Lark - Series Three, a ten-disc set, featuring nineteen mostly-unreleased, digitally re-mastered episodes, originally broadcast between November 1960 and March 1961, and a bonus Radio Lives programme about Jon Pertwee (the sleeve art suggests this is called Radio Roots). The RRP is £65. ... three full-cast Dorothy L. Sayers dramatisations starring Ian Carmichael as the dapper Lord Peter Wimsey: The Unpleasantness at the Bellona Club, Murder Must Advertise and Clouds of Witness. Unpleasantness and Murder Must Advertise are two-disc sets, Clouds is a three-disc set. All have an RRP of £12.99. 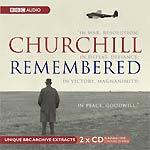 ... and a two-disc Churchill Remembered set, featuring unique BBC archive material, including contributions from Nancy Astor, Oswald Mosley and Churchill himself. The RRP is £12.99.